« Poll: Should Rhino Horns Be Poisoned? The fascinating rhino facts below are brought to you by International Rhino Foundation. Enjoy! 1. A group of rhinos is called a ‘crash’. 2. White rhinos aren’t white (and black rhinos aren’t black). The white rhino’s name is taken from the Afrikaans word describing its mouth: ‘weit’, meaning ‘wide’. Early English settlers in South Africa misinterpreted the ‘weit’ for ‘white’. 3. 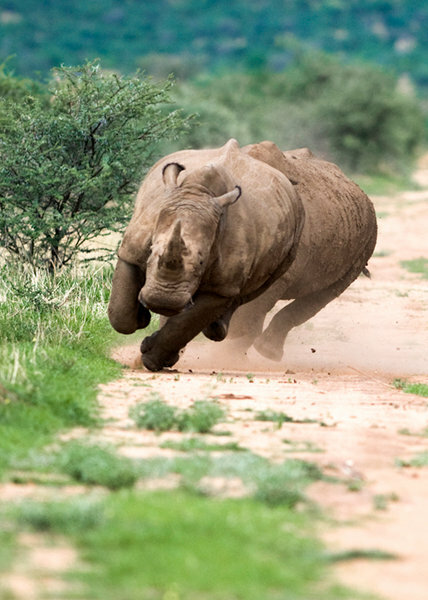 Rhinos are fast! They can run up to 30–40 miles per hour, which may not sound like much, but if one is running straight towards you it feels like a NASCAR race car is coming your way. 4. Rhino pregnancies last 15-16 months. Yikes! 5. A rhino’s skin is much softer than it looks, and is actually quite sensitive to sunburns and insect bites (that’s why rhinos like rolling in the mud so much – it helps to protect them from the sunburns and insects). 6. Contrary to the common myth, there is no evidence that rhinos stamp out forest fires! 7. The white rhino is the largest rhino (and the largest land mammal after the elephant) – they can weigh up to 6,000 pounds. 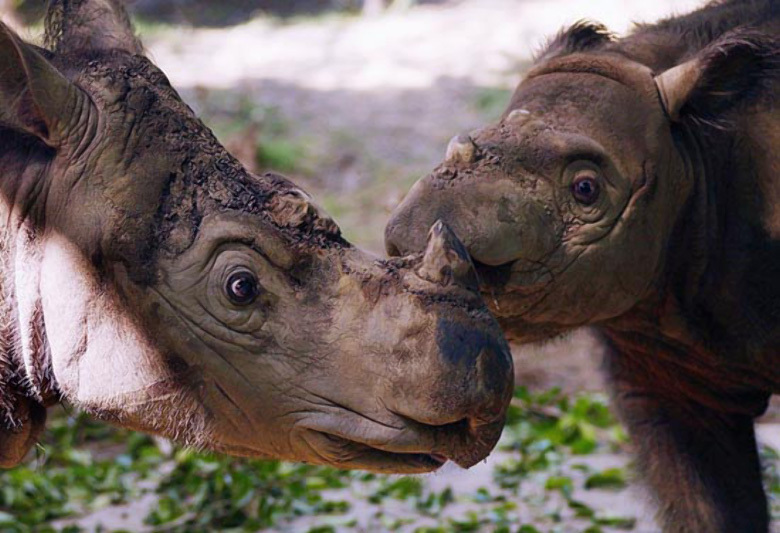 The Sumatran rhino is the smallest rhino, weighing in at a mere 1,300–2,000 pounds. 8. Rhinos have poor eyesight, but very well-developed senses of smell and hearing (and they will charge at you when startled – the best way to escape is by climbing a tree, if one is handy!). 9. African rhinos have a symbiotic relationship with oxpeckers, also called ‘tick birds’. In Swahili, the oxpecker is called ‘askari wa kifaru’, which means ‘the rhino’s guard’. 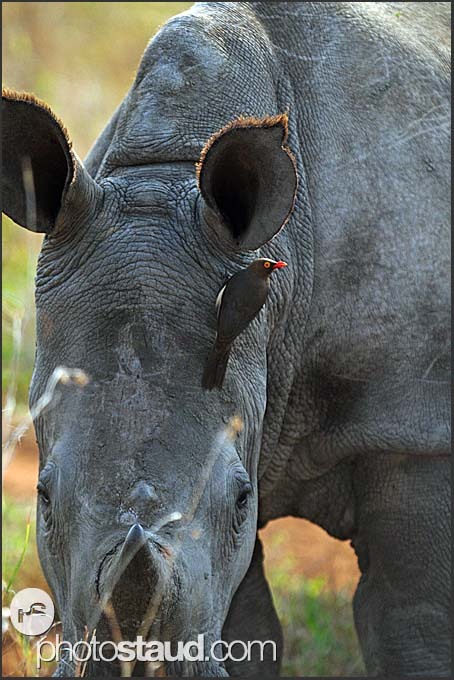 The oxpecker eats ticks and other insects it finds on the rhino, and creates a commotion when it senses danger. 10. Most rhinos use piles of dung to leave ‘messages’ for other rhinos – nuances in the smell of dung can tell a rhino a lot about others in the area. Each rhino’s smell identifies its owner as unique – the smell is different for young vs adult animals, for males vs females, and females in estrus vs non-reproductive females. Combined with urine left along trails, dung piles create invisible ‘borders’ around a rhino’s territory. 11. Rhinos have existed on earth for more than 50 million years, and once roamed throughout North America and Europe (as well as Asia and Africa). 12. Throughout their history, rhinos have been a very diverse group. The extinct rhino Paraceratherium was the largest land mammal that ever lived, and resembled a big, muscular giraffe. Telecoeras was a single-horned, hippo-like grazer common in North America. 13. The book, The Wonderful Wizard of Oz, written by L. Frank Baum and illustrated by W.W. Denslow, differs a lot from the movie classic, and actually has a reference to rhinos. Dorothy, the Scarecrow, the Tin Man and the Lion each get to meet the Wizard individually and he appears differently to each one of them. To Dorothy he appears as a huge head, to the Scarecrow as a beautiful woman, to the Lion as a great ball of fire, and to the Tin Man as a terrible beast. The beast is described as such, ‘It was nearly as big as an elephant, and the green throne seemed hardly strong enough to hold its weight. The Beast had a head like that of a rhinoceros, only there were five eyes in its face. There were five long arms growing out of its body and it also had five long, slim legs. Thick woolly hair covered every part of it, and a more dreadful-looking monster could not be imagined.’ Somehow, this never made it to the film version. 14. Three of the five surviving rhino species (black, Javan and Sumatran) are Critically Endangered, which means there is at least a 50% chance that these species will become extinct within three generations (for rhinos, this means about 30-60 years). 15. The ancient woolly rhino, whose entire body was covered in a thick, shaggy coat, was hunted by early humans and is depicted in cave paintings dating back more than 30,000 years ago. The Sumatran rhino is the closest living relative of the extinct woolly rhino (and they’ve got the hair to prove it!). 16. 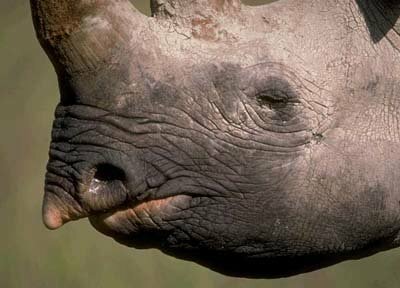 The black rhino has a prehensile lip which allows it to feed on trees and shrubs (the other African species, the white rhino, has a long, flat lip for grazing on grasses). See the Black Rhino’s narrowed lip designed for browsing? 17. The Javan rhino is the rarest land mammal in the world. Less than 50 individuals survive in only two locations (Cat Tien National Park in Vietnam and Ujung Kulon National Park) in Indonesia. 18. Not all rhinos are solitary – both black and white rhinos commonly live in extended family groups (particularly females and calves). 19. Rhino horn is not used as an aphrodisiac in traditional Asian medicine. It is actually used to reduce pain and fever, although there is no scientific evidence to support this usage, and of course, it is illegal. 20. Sumatran, black and white rhinos all have two horns, Javan and greater one-horned rhinos have one horn (and some female Javan rhinos don’t appear to have a horn at all). 21. The most famous piece of rhino artwork is Albrecht Durer’s woodcut, ‘The Rhinoceros’, printed in 1515. It (not entirely accurately) depicts a greater one-horned rhino sent as a gift from the King of Portugal to Pope Leo X, and has been reprinted countless times over the past 500 years. 22. The word rhinoceros comes from the Greek rhino (nose) and ceros (horn). 23. Depending on the species, rhinos can live to between 35 and 50 years old. 24. Rhino horns are made of keratin, the same material that makes up your hair and fingernails. 25. The closest living rhino ‘relatives’ are tapirs, horses and zebras. Visit http://www.rhinos-irf.org/ to learn more about rhinos and rhino conservation. One-Horned Rhinos, only 435 left! This entry was posted on August 9, 2010 at 9:25 pm and is filed under Africa: Rhinos, Asia: Rhinos with tags Africa, animal blog, animal blogs, Animal Rights, Animals, animals blog, Anti Poaching, Asia, Black Rhino, CITES, Conservation, Education, Endangered Species, Environment, Extinction, Illegal Animal Trade, illegal hunting, Java Rhino, One-Horned Rhino, poaching, Rhino, stop poaching, Sumatran Rhino, White Rhino, wildlife, wildlife blog, wildlife blogs, wildlife conservation blog. You can follow any responses to this entry through the RSS 2.0 feed. You can leave a response, or trackback from your own site. Yes, thankyou. Makes me even sadder at their plight. I’ve seen how tame they are when hand reared from orphans. I hope and pray for their future. It’s up to us, those that do care, and there are many, to do something positive towards saving the rhino species. Wow! I knew more about the rhino than I thought I did! why do we hav e this mission to destroy every creature, flora, fauna, that has existed for million of years???? ?are we jealous?? you know damned good and well.we won’t! and perhaps, we don’t to! typo…perhaps we don’t DESERVE to. Sorry! Good Luck! It pays to read, doesnt it…..smile….and the special thing is you will be passing on such very important information to others…and so on and so on and so on!!! Fantastic – So interesting, very well presented, makes easy reading. Waiting for another episode on another animal? I had the pleasure of seeing a Rhino in the wild, while I was in Nepal at Tiger Tops . Courrtesy of The Dating Game,,I came to love Rhinos and Elephants, as well as the maginificant Tiger and the other lovely wildlife. Peacocks and Pean hens.etc. I pray that somehow one day soon the poaching , murder and abuse will stop. These are God’s wonderful creations and serve a purpose to this planet and it’s survival.